This loom is Commander66 ECU specific. It is pre-wired on the ECU side connector, with sensors and actuators connectors not installed. Its length is to be adapted when intalling on the vehicle, then the sensors and actuators connectors will be wired. 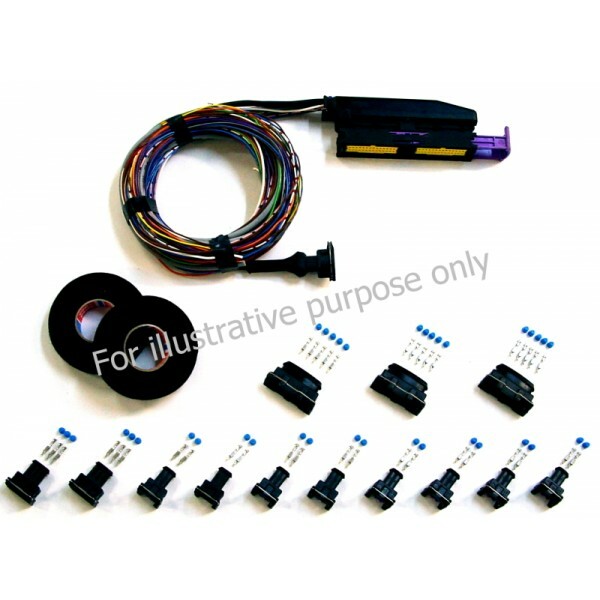 • The connectors of the standard sensors* and standard actuators* that are delivered with the kit are provided. • The various branches of the loom are labeled (grounds, power supplies, measurements, auxiliary commands, injectors, ...) but not sheathed. High quality canvas adhesive tapes are provided to finish the sheathing when installing. These are the sensors that belong to the engine accessories list. These are the actuators that belong to the engine accessories list.